Are you tired of looking at those ugly, damp, cold concrete basement walls? If so, it's time for an upgrade! 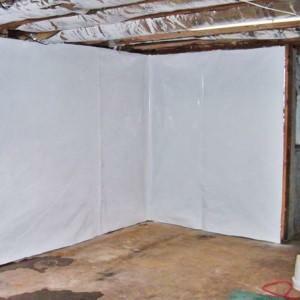 All of our basement wall panel systems stop water vapor from coming through the walls and resist mold and mildew. The experts at TerraFirma can help you select the solution that's right for your needs. To request a free in-home consultation and estimate in Seattle, Portland, Tacoma or nearby, give us a call or click below. ThermalDry® Radiant Barrier creates a waterproof radiant heat barrier on your basement walls. Its reflective surface is designed to keep heat inside your basement where it belongs -- up to 97% of the heat that reaches it will be reflected back into your home. If you're interested in an easy way to upgrade your basement walls, there's nothing quite like the VaporLoc Wall System. Like our other wall systems, it can hold back water vapor passing through your foundation walls, directing it to your sump pump. With anti-microbial protection built right in, no mold or mildew will grow on the walls! If you have stone walls, an exposed ledge in your basement, or dirt floors, VaporLoc is the perfect solution! With its 25-year warranty from rips or tears, you can be sure it's strong enough to do the job! Whether you're thinking about finishing your basement or simply want to prevent water intrusion, we offer versatile basement wall solutions that can give you a drier, brighter, more comfortable basement. We offer free estimates on all our basement waterproofing products and services in Seattle, Portland, Tacoma, Vancouver, Bellevue, Eugene, Renton, Hillsboro, Salem, Gresham and nearby. Contact us today!